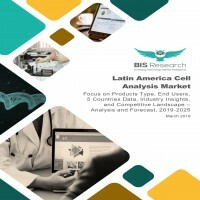 The purpose of this study is to gain a holistic view of the Latin America cell analysis market in terms of various influencing factors such as recent trends, regulatory frameworks, and technological advancements in the market. The scope of this report constitutes a detailed study of the different kinds of products associated with the Latin America cell analysis market. The market has been segmented into “Product Type”, “End User”, and “Country”. The report presents the reader with an opportunity to unlock comprehensive insights with respect to the market and helps process well-informed strategic decisions. The research uncovers some of the substantial parameters that must be taken into consideration by the industry players before entering the market. The research study highlights the factors governing the industry attractiveness derived through Porter’s Five Forces Analysis for a comprehensive understanding of the Latin America cell analysis market. Moreover, the study includes detailed product mapping, market estimation, and analysis of key trends in multiple regions, growth of cell analysis market in each region for different cancer types, and the key strategies and developments by the prominent cell analysis market stakeholders. • What are the key features of the cell analysis technology promoting its incorporation in different clinical applications? • What are the processes involved in cell analysis? • What are the major market drivers, challenges, and opportunities in Latin America cell analysis market? • Which are the leading companies dominating the Latin America cell analysis market? • What are investors’ perceptions about the Latin America cell analysis market? • What was the market value of the leading segments and sub-segments of the Latin America cell analysis market? • How will each segment of the Latin America cell analysis market grow during the forecast period, and what will be the revenue generated by each of the segments by the end of 2025? • How will the industry evolve during the forecast period 2019-2025? • Which country will register the highest sales in Latin America during the forecast period? The cells constitute distinct units of biological functions, and analyzing cells helps identify and map the biochemical and physical processes of the life of a patient. Compiling data sets from the multiple cell analysis investigations help the scientists get a better understanding, and predict the influence of, factors that lead to changes in the cell proliferation, cell health, cell function, and cell death in a human body. Also, analysis of cells plays a major role in the gene identification process, epigenomics, and related areas of life-science that focus on the study of genotypical and phonotypical characteristics of the cells. Certain treatments for infectious diseases delay disease progression and the onset of associated complications. With the rising geriatric population that’s more prone to illness and the increasing prevalence of the chronic diseases, the modern age medicine needs to include proper analysis, as well as alternative therapies for the treatment of such conditions in affected patients. These factors are also prerequisites for an improved quality of life of the patients after they have been cured. The purpose of this study is to gain a holistic view of the Latin America cell analysis market in terms of various influencing factors such as recent trends, regulatory frameworks, and technological advancements in the market. The scope of this report constitutes a detailed study of the different kinds of products associated with the Latin America cell analysis market. The market has been segmented into “Product Type”, “End User”, and “Country”. The report presents the reader with an opportunity to unlock comprehensive insights with respect to the market and helps in forming well-informed strategic decisions. The research uncovers some of the substantial parameters that must be taken into consideration before entering the market. In terms of end user, the Latin America cell analysis market is dominated by pharmaceutical and biotechnology companies. The growth can be accounted to the increased awareness and adoption of cell analysis tests for an early detection and treatment of infectious diseases. The shift from chemical-based small molecules to the biology-based larger molecules such as protein and antibodies is supporting the growth of the pharmaceutical and biotechnology companies’ segment. Latin America majorly focuses on research for the development of relevant drugs and providing vital real-time information on tumor profiles and chronic diseases, further facilitating the prognosis and treatment approach for healthcare professionals.